In the summer of 1969, thirty-two bands were scheduled to perform on a small dairy farm in New York State. In the weeks leading up to the show, concert promoters estimated that no more than 200,000 people would attend. But when the festival started, excited concertgoers couldn’t wait to spread the word about the show – and they started calling everyone they knew from payphones. Before long, thousands of people flocked to the concert, hoping to get a glimpse of Janis Joplin and Jimmy Hendrix, wanting to take part in what would become the cultural event of the 1960’s. In the end, over 400,000 people showed up for the concert, which is now simply known as Woodstock. That’s the power of word of mouth marketing. Imagine if every one of your members were talking about your organization like Woodstock fans, and wanted to share your group with everyone they knew. You’d double your growth in no time flat. In this article, I’ll cover 15 time-tested tactics for encouraging word of mouth promotion and provide tips on how to encourage individuals to spread word about your nonprofit and your mission. The Collegiate Information & Visitor Services Association (CIVSA) successfully increased their membership using the power of word-of-mouth marketing by creating some healthy competition among their members. Whenever a current CIVSA member recruits a new member, that person’s name is entered into a drawing for a gift basket. A discount on a monthly or annual membership. An end-of-year award for the people who recruited the most new members. A gift card for each new member recruited. Host an in-person event, and making your event a memorable experience for attendees by bringing in a popular speaker, giving out top-notch swag, or offering people the chance to take fun pictures in a special photo booth. Enter all your event attendees into a drawing for a special gift at the event. The person who wins the gift will love telling the story of his or her big win – and the people who didn’t win will talk about how amazing the giveaway was. Create buzz for your event on social media by crowdsourcing your event content, creating event pages on social media sites (like Facebook), live streaming your event, or creating an online “Conference Photo of the Day” contest. Make your member meetings extraordinary by giving attendees coloring books, holding your meeting while you play a pickup basketball game, or making people sing the Star-Spangled Banner if they come in late. The more you engage with your members, the more likely they’ll be to promote your organization to their peers. Encourage your members to share your email messages by include unique and exciting stories, or useful educational content. Make your emails so helpful and interesting that people won’t be able to stop themselves from forwarding them to their friends and family. Your phone calls can be memorable, too. Think of a personal and memorable way to say “thanks” when you call current members to tell them you appreciate their membership, donation, or event attendance. Your organization will stick out in people’s minds when they have the opportunity to speak to someone, one on one, about something related to your organization. Make it easy for your members to engage with you online by publishing free content regularly, telling visual stories on social media sites like Pinterest and Instagram, and enabling comments on your blog posts, social media posts, and online forums. Press releases are a great way to generate media coverage for your organization. The trick is writing a compelling release that piques reporters’ interest. You can start by creating a well-written, attention-getting press release about your news item. As you’re writing your release, always remember that your job is to inform the press about what’s going on in your organization (whether it an event, fundraising campaign, staff change, or other newsworthy happening), not to sell the reader something. Here’s a template you can use to start your writing process. Once you’ve completed your news release, find appropriate media targets, and distribute the release to reporters who cover news related to your organization or cause. For more information, check out the article Promoting Your Not-for-Profit through Public Relations on the GuideStar website. You can probably come up with a quick mental list of your most engaged members. These are the people you’ve built a personal connection with – the ones who show up for every event and are the first to respond to your organization’s emails. But, have you ever asked these ultra-engaged members to help you spread the word about your organization? For example, if you’re a sailing club, you can ask whether your members know any other sailors, or if they regularly attend sailing-related events where they could mention your group. You can also ask your members if there’s anything they need to help strike up conversations with their peers about your organization. You can offer things like phone scripts, emails templates, brochures, and business cards. You can even direct your members to your crowdfunding page for extra details about your latest project. Some nonprofits I've worked with feel squeamish when it comes to asking their members to spread the word. They often say they don't want to come across as "salesy". From my experience, the opposite is true – people like helping their friends and family members, and don’t mind being asked to share useful information. Why not take the words out of someone’s mouth, and use those words to your advantage? Testimonials are a highly effective marketing strategy, and it’s a good idea to include them on your website, in your brochure copy, and on your social media profiles. Researchers have even found that adding testimonials to lead generation pages (like a website page where you ask a potential member to join) can increase conversions by 50%. That means 50% more people may sign up to join your organization if you include a testimonial on your sign-up page. To get started, ask your most engaged members if they’re willing to give you a quote about your organization, to use in your marketing materials. If someone seems willing, but hesitates to get back to you, send that person a pre-written testimonial and ask him or her to approve or edit it. It’s easier to edit a testimonial than it is to write one from scratch. Attention-getting headlines will help you get more eyeballs on your blog posts, emails, events, and newsletters. If you don’t grab the attention of your potential readers with an attention-getting headline, you’ll never get them to read your content, and share it with others. If you want to learn to write better headlines and subject lines, check out this "Fill in the Blank Worksheet" on Kivi Leroux Miller’s Nonprofit Communications blog. This is an important one: You simply must build trust with your members. Without that trust, they’ll never recommend your organization or send you referrals. Make sure you’re being honest and transparent with your members, and always keep your promises. If you mess up, apologize (publicly, if you need to). To establish trust with your members, you can take steps such as relying on data to support claims. Data signifies hard facts to people, which is hard to argue with. Also, focus on the outcomes of projects and drives. These outcomes show people that what you’re doing really works. It is the sign of success, which gives them faith in your work. Another way to build trust is by hosting a pledge drive with your donors. When you ask for pledges to support your organization, you show your supporters that you trust them to keep their pledge promise. Pledges differ significantly from donations, which are paid immediately. Pledges require a lot of trust in your supporters because they are donation promises which will be paid out at a later date. When you show trust in your donors, they can more clearly see the reciprocity of the relationship, encouraging them to trust you as well. In addition to showing your trust, pledging also opens up further communication with your donors as you can send thank-you messages and reminders to them. Don’t forget to be transparent about what the pledge is for. After the drive, show people what the outcome of the drive was. Show them all the good that came from a mutually trusting relationship with you. Does your organization go above and beyond to recognize and take care of your members? When you can, get to know your members personally. Call people by their first names, recognize birthdays, anniversaries, and other special events, and make everyone feel like they’re a valued member of the team. Even small touches like this can make a big difference in how people feel about being a member of your organization – and they’ll talk to others about how you made them feel special. When your members feel appreciated, they’ll be more likely to talk about your organization with others. Create a video thank-you message from the leader of your organization, and publish that video on your website, your social media profiles, and your email newsletter. Each year, make a list of all the events, services, and educational opportunities that were made possible by your membership fees. Publish the list on a separate page on your site, and link to it on a regular basis in your online content and email campaigns. Host a yearly event to say “thank you” to your members. Consider a member brunch, picnic, pool party, or other fun gathering. Write handwritten thank-you notes to your members. In our digital age, a personalized note is even more meaningful and memorable. When you make people the hero of your nonprofit, it makes them feel special – and they’ll brag about what they’re doing for your organization all over town. For example, when I trained for months to climb the CN Tower in Toronto as fundraiser for the United Way, I wanted to tell everyone I knew about my efforts. My “bragging” helped to spread the word about what I was doing, and raise money for the organization. In the same way, consider giving people the chance to do something amazing for your nonprofit – something they can feel proud of, and talk about to their friends and family members. Brainstorm some possible “hero moments” like this – they can really work as a way to kickstart word-of-mouth. Every person you meet is an opportunity to share your organization and gain a prospective member. To make sure you’re always ready, prepare a simple, concise elevator pitch about your organization, and always keep your business cards with you. If you need help, check out this helpful article on creating an elevator pitch for your nonprofit. You’re more likely to get people to share your online content (including your social media posts and emails messages) if you recruit a team of “share volunteers”. These folks will repost or distribute your content when you have something special you’d like to promote (like a particularly useful blog post, a social media post announcing a big event, and so forth). Reach out to engaged members to ask them to become share volunteers, or ask for volunteers using your newsletter. When you’re sharing content (like videos, podcast episodes, or blog posts), you can actually find out which are picking up more traction online. Once you know what resonates with your audience, you can shift your content strategy to include more of those popular messages. To make tracking easier, you can use use a strategy called “link tracking”. In a nutshell, you’ll create a series of individual links, use Goo.gl or Bit.ly for the different messages you’re sharing online (for example, different links for Facebook, Twitter, email messages, etc.). Then you can check out the tracking dashboards of Goo.gl or Bit.ly to see how many times your messages are getting shared – and which tools people are using to share those messages. With this knowledge, you can figure out why certain messages worked for your audience, and then extend that message to other places to increase shares even further. If you want more social shares, make it easy for people to share your stuff! Give people short, interesting tweets to share on Twitter. These little quotes are called “tweetables”, and you can make it even easier for people to share them by creating links using Click to Tweet. Create shareable images (like the one I’ve included in this post) using tools like DesignWizard, PicMonkey or Stencil. Your members can share the images on Facebook, Instagram, and Twitter, which can greatly increase the number of people talking about your organization. Check out this post for the latest size requirements for social media images on different platforms. Create a hashtag to use for your organization or event. A hashtag is simply a word or phrase, preceded by a pound sign, that is used to identify messages on a particular topic. Before you announce your hashtag publicly search for it on Twitter to make sure it hasn’t already been claimed by another group. 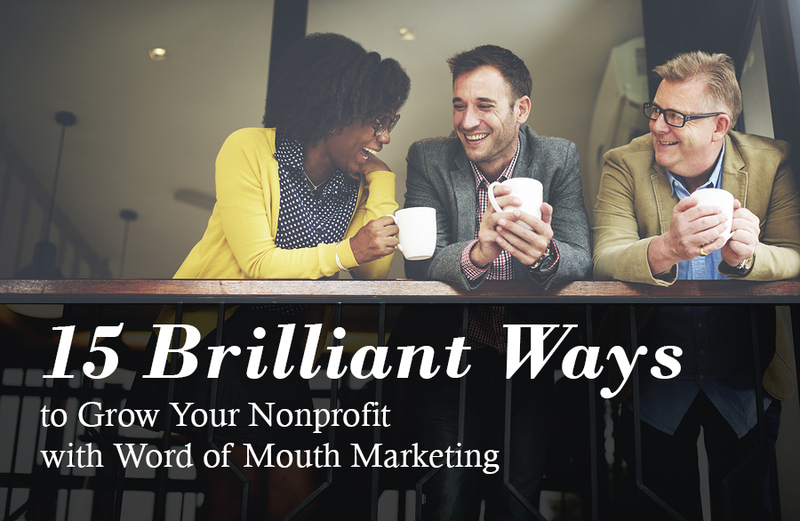 Word of mouth marketing is one of the best and most effective ways to prospect for new members, encourage donations, and recruit volunteers – and the best part is, it’s free! If you’d like to learn more about word-of-mouth marketing, check out the excellent book, Word of Mouth Marketing: How Smart Companies Get People Talking. In the meantime, use these fifteen tips to get members talking about your organization online, and in person, and get ready to see your membership numbers rise.